Ever since I found out Maya was going to be a girl, I had visions of this girl-without-a-face dancing. If it sounds ridiculous, indulge me … but truly, that’s what I thought about. Maybe because I started dancing at age three, or because I loved dance (and danced four classes a week til cheerleading and coaching demands took over in high school …) … Who knows, but thoughts of a little ballerina danced in my own head and helped carry me through a really difficult pregnancy. I couldn’t wait to meet this little ballerina kicking in my belly. Since we wanted to take a break from swimming lessons this winter (who wants to go outside into sub-zero temps after swimming?! ), I hunted around to see what local dance studios would take two-year-olds, and the program that seemed best-suited for Maya was a Jitterbugs class at the Y — a creative expression/dance class for 18-36 month olds. A good friend and I enrolled our kids, and today was the first class. 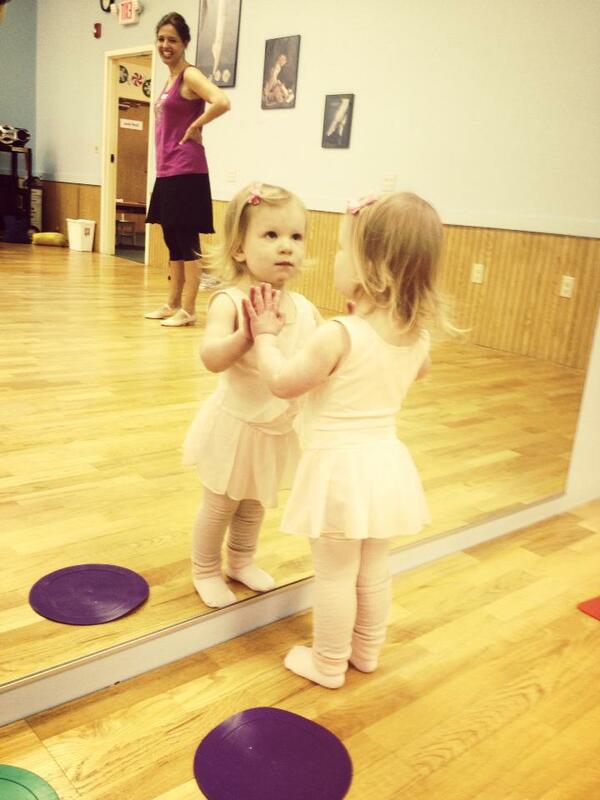 Though it took her a while to warm up, she eventually did …in typical toddler form, right before the class was over! The thing was, it was something new … and therefore inherently intimidating. But that’s what life is about: pursuing new things and giving strange, new things a shot. Even we adults struggle with this from time to time. I’m pretty sure there will be a lot of dance school in our future. We just needed to take that first step. How about you? Do you remember being intimidated when trying something new as a child? What helped you get through it? Maya looks so angelic and beautiful in that picture! Love.